The House of the Faun is located on the Via della Fortuna (an extension of the Via di Nola) at Regio VI, Insula 12, Doorways 2-5. An Oscan inscription found within the house names the aedile Satrius, which suggests that the ancient Campanian family of the Satrii may have owned the house. This family, which suffered under Sullan proscriptions, returned to political prominence in the period after the earthquake. The name of the house comes from a statue of a dancing faun, or satyr, found in the Tuscan atrium. The house was first excavated during the years 1830-1832, with later stratigraphic excavations done in 1961-65. The House of the Faun, with its elaborate decoration and extensive plan, represents one of the most important examples of Roman architecture of the second to first century BC. This house was among the largest and most elegant of the houses of Pompeii. It took up an entire city block (c. 80 m. long by 35 m. wide or 315 by 115 ft.) and was filled with beautiful works of art, including the famous mosaic depicting Alexander the Great at the Battle of Issus, and wall paintings of the First, Second and Fourth Styles. The decoration of the house is heavily influenced by Hellenistic models. The House of the Faun was originally built in the Tufa Period of Pompeii's architectural history, in the early second century. In this period, the house was focused around two atria. It had one a large Tuscan atrium, and the other a smaller tetrastyle atrium, while the back of the house had a large kitchen garden. 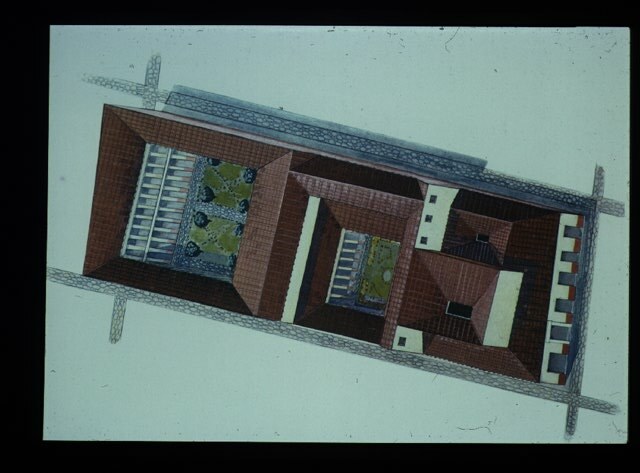 This two-atria plan represented an attempt by the patron of the house to separate the formal functions of the atrium, the reception of clients and conduct of business, from its private functions of everyday family life. 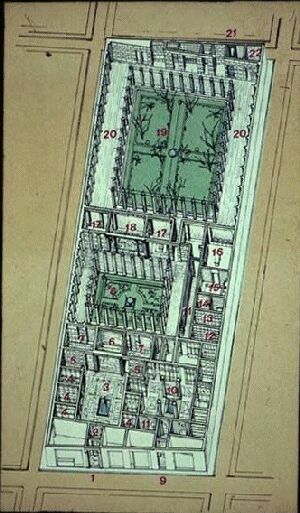 This type of plan is an intermediate step between the simple atrium house, with a single atrium complex, and the atrium and peristyle house. Apparently, the two-atria plan did not prove ultimately satisfactory for the owners of the House of the Faun. In the late second century BC, a peristyle was added to the north of the original two-atria nucleus, along with a service quarter to the eastern side and reception rooms to the north. The rear of the house contained the kitchen garden. To this later period of the house belong its wall decorations in First Style and its famous mosaics. 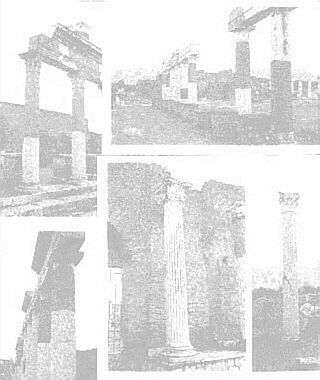 Finally, another peristyle was added around the time of the Early Roman Colony, that is, in the early first century BC. This peristyle included more reception rooms along the south side, and smaller rooms, perhaps for servants, to the north. The center of the new peristyle was occupied by the kitchen garden. With these renovations, the house acquired a new focus around the peristyles. The peristyles represented a private retreat for the family, a place where they could relax and entertain special guests. The front part of the house was kept for more formal occasions. The addition of service quarters reflects a further differentiation of function in the house, again separating the daily life of the family from the more public reception areas.